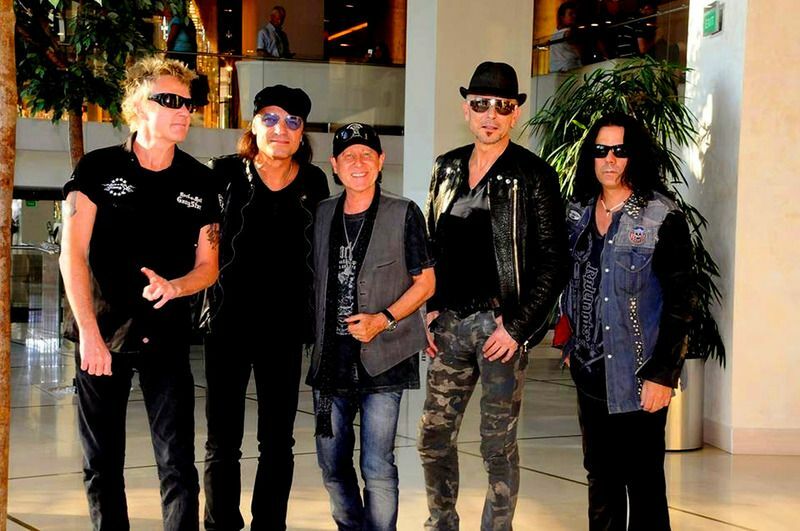 Scorpions are a German rock band formed in 1965.Since the band's inception, their musical style has ranged from hard rock to heavy metal.The band's only constant member is guitarist Rudolf Schenker, although Klaus Meine has been the lead singer for all of their studio albums and guitarist Matthias Jabs has been a consistent member since 1979.They are known for their 1980s rock anthem "Rock You Like a Hurricane" and many singles, such as "No One Like You", "Send Me an Angel", "Still Loving You", and "Wind of Change". The band was ranked number 46 on VH1's Greatest Artists of Hard Rock program. 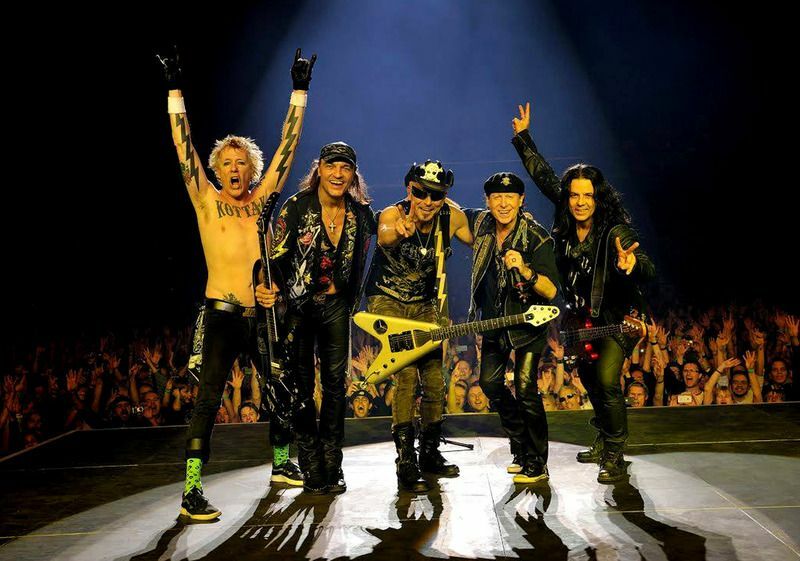 "Rock You Like a Hurricane" is also number 18 on VH1's list of the 100 Greatest Hard Rock Songs.The band is one of the world’s best-selling bands of all time, with claims of sales over 100 million records worldwide..On October 23, 2014 Scorpions' leader Klaus Meine spoke to the band's French fan-club Crazyscorps, and announced that the new record would be published in February or March 2015, to coincide with the band 50th anniversary. Contrary to what the band said in 2013, the new record will present not only newly recorded versions of never-published songs, but also new material, written between 2011 and 2014. The album is being recorded in Sweden, with producers Martin Hansen and Mikael Nord Andersson. Drummer James Kottak, who left the band in May 2014 for rehab, will play drums on the new record. The album will be called Return to Forever would be released in February 20, 2015. To celebrate their 50th band anniversary, SCORPIONS are releasing today, November 6, the 50th Anniversary Deluxe Editions of all their most famous albums. 1965 marks the starting point of one of the most successful rock bands of our time. Hailing from Hannover, Germany, SCORPIONS embarked on a journey that would lead them around the globe and would establish them as one of the greatest rock bands of all time.For the occasion Scorpions open their vaults to unleash hitherto unreleased songs, alternative versions of big hits, video clips, unreleased concerts and more.In addition to dozens of unheard studio tracks and live recordings, all albums are remastered, equipped with extended booklets featuring rare photos and single covers, backstage passes and additional liner notes by Edgar Klüsener, a former editor in chief of Metal Hammer who has followed the band's career closely over several decades. Five of the eight albums are accompanied with a DVD that contains live concert footage from the respective period, together with TV performances and in-depth interviews with the band, where they talk about the background history and the creative process of each of these albums. 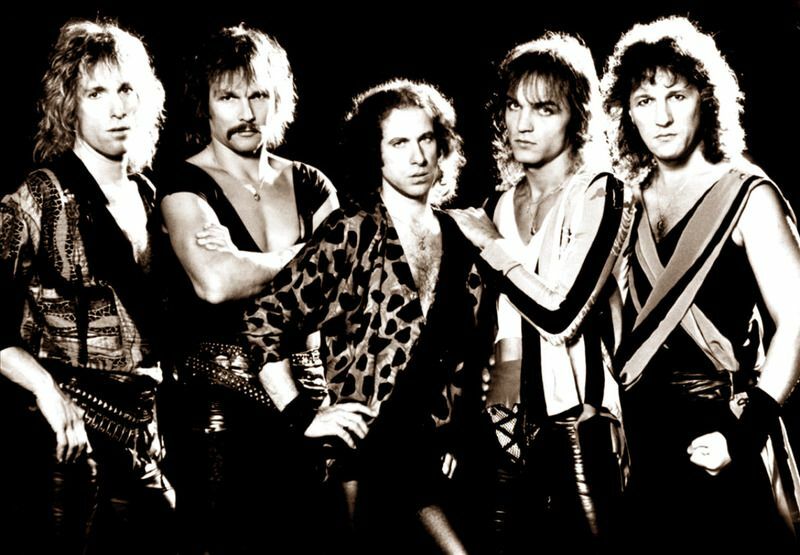 Second live album of Scorpions. After publishing Tokyo Tapes, their previous live album, Uli Jon Roth left the band and were replaced by Matthias Jabs so this live album is mainly focused on the studio albums of that era, maybe their most important in terms of comercial success and popularity. This edition belong to the Deluxe editions celebrating the 50TH anniversary of the German band. Eight albums have been published in total, mainly from 80's era. Some of them content rare, outtakes or previously unreleased songs as bonus tracks. Additionally, some of the CD editions are accompanied by a DVD with TV appearances, video-clips and or the band talking about the making of the album. The DVD included is the World Wide Live video, previously published only in VHS, the whole video with songs, sketches, behind the the scenes... The image is good enough for a DVD if we think it was recorded thirty years ago, but the sound is super-b although no 5.1 remix is included. And as a new stuff we can find the making of the album told by Matthias, Rudolf, Klaus and Herman Rarebel, their drumer at that time. 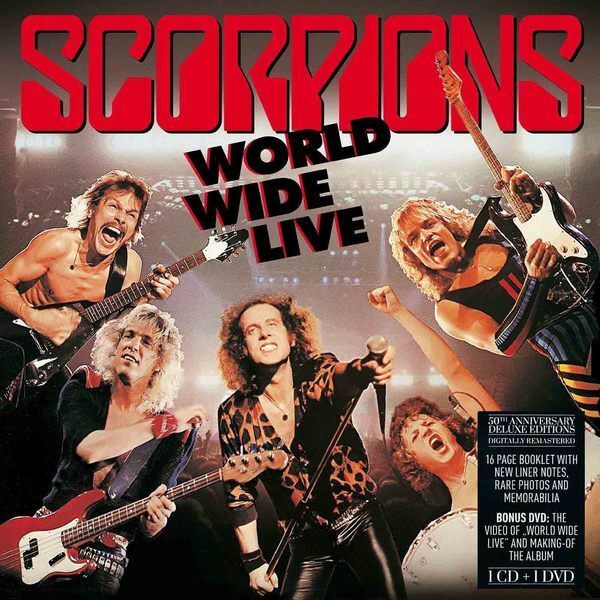 World Wide Live is a live album by German heavy metal band Scorpions released in 1985. The original audio recording was produced by Dieter Dierks. 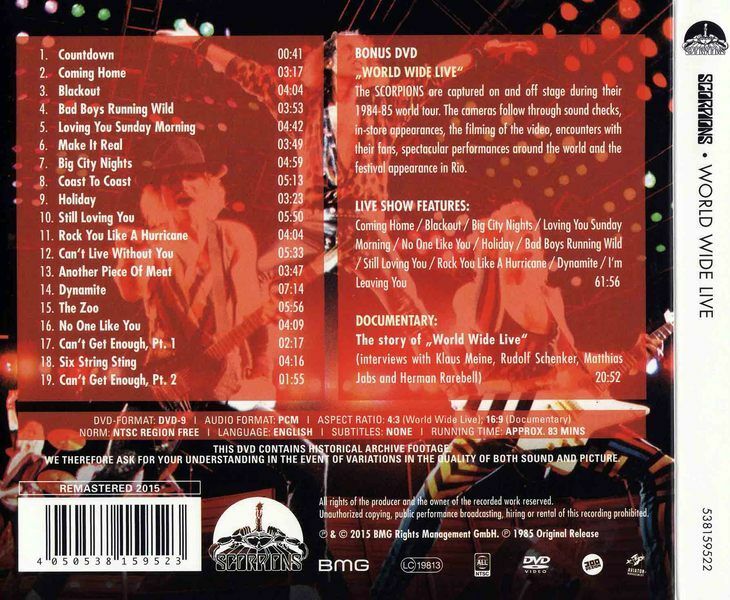 A VHS was released at the same time with footage of Scorpions' world tour.The live album was originally released as a 2LP vinyl set, in a gatefold-sleeve, and a cassette. The liner notes contain a crew member list, tour date information and when the shows were recorded:Sports Arena, San Diego, CA, USA (4/26/84) The Forum, Los Angeles, CA, USA (4/24/84 & 4/25/84) Pacific Amphitheatre, Costa Mesa, CA, USA (4/28/84) Bercy, Paris, France (2/29/84) Sporthalle, Cologne, West Germany (11/17/84) The initial CD release featured 15 tracks (dropping "Another Piece of Meat", "Six-String Sting" and "Can't Get Enough", parts 1 & 2, due to time constraints), but the remastered edition of 1997 features the original album in full.